popular online financial services. Its popularity is not only because it is user-friendly, but also because PayPal uses multiple layers of data encryption and top-of-the-line security measures to make all transactions safe and secure. PayPal has an effective risk management and fraud control that protects both buyers and sellers. 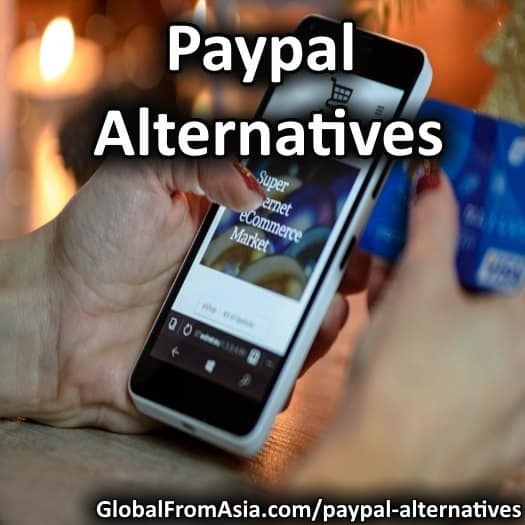 However, it isn’t perfect; complex fees associated with using it is its major drawback, as is the fact that PayPal can freeze your account anytime for almost any reason. So, just in case you want to try other payment solutions, read on. What Are Some PayPal alternatives? TransferWise: TransferWise is a popular cross-border payment provider. As its tagline says, “Money without borders.” TransferWise makes sending money abroad easier and less expensive, letting people send money abroad at the lowest possible true cost. For merchants that have customers abroad, TransferWise can be a good option to get paid for its real exchange rates and tiny not-hidden fees. Advantages: Real-time exchange rate, 8x cheaper than banks, Transfer can take as little as 24 hours, fair pricing and awesome customer service. 2checkout: 200+ global markets, 15 languages, 87 currencies, 8 payment types. 50,000+ merchants,18 years of experience. These numbers simply tell why 2checkout is one of the leading global payment platforms in the world. It accepts online and mobile payments from buyers worldwide, with localized payment options. It has flexible integration, advances fraud protection and large global reach. Advantages: Easy payouts, flexible payment methods, no monthly fees, large global reach, recurring billing system, and advanced fraud protection. Stripe: Stripe is a popular San Francisco-based payment platform that accepts payments online and in mobile apps. Today, it supports over 100,000 merchants from more than 100 countries and across nearly every industry. It offers 3 main services: Payments, Subscription and Stripe Connect. Advantages: Large global scale, works with Alipay and Apple Pay, subscription and recurring payments, no refund fees, seamless integration, customizable checkout and buy buttons in mobile apps. Payoneer: New York-based financial service that was founded in 2005. It operates in over 200 countries, supports over 150 currencies, has more than 4 million users and supports nearly 40 languages. Payoneer empowers global commerce by providing a seamless cross-border payment platform. Among its features are Mass Payouts, Escrow and International Money Transfer. Advantages: It offers MasterCard so it doesn’t require a bank account when signing up. Fast local bank transfer. Virtual US bank account. Integrated with Google Adsense, Odesk/Upwork, Elance and Fiverr. Skrill: Skrill is a London-based company that offers global payment solutions since 2001. It offers various services such as E-wallet, Money Transfer, Online Payment, Forex and many others. Advantages: Fast verification process. Best for online gamblers. Anti-fraud management. No charges on credit card processing. Fairly cheap cross-border fees. Fewer restrictions. In a previous blog post, we’ve talked about many different payment platforms through which you can open a Merchant Account. PayPal has been there for a very long time, making it the most popular payment platform. However, ecommerce is taking the world by storm and more companies took steps to compete with PayPal. Opening a Merchant Account doesn’t have to be complex and time consuming; however, it is important to know which payment platform is best for you. It’s vital to understand all the details pertaining to rates, fees, speed, and process to ensure a smooth transaction. Are you planning to apply for a merchant account? Read this Merchant Account Comparison blog post to help you get to know more payment platforms other than PayPal.